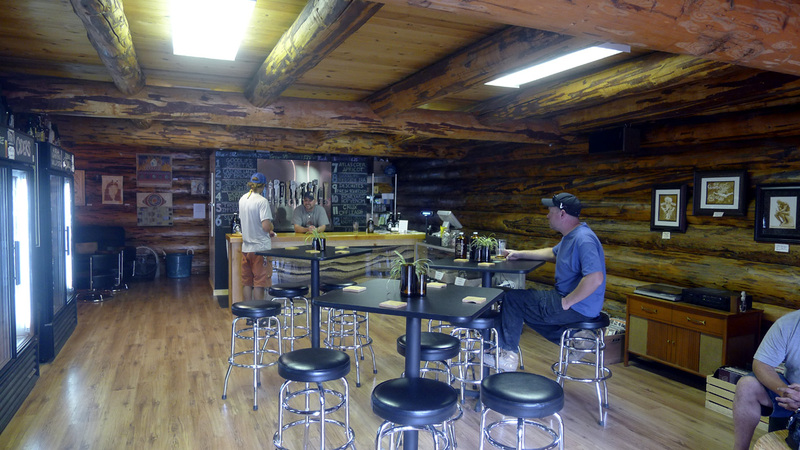 Sunriver is a great example of what's happened to craft beer during the last few years. Not so long ago, you had to drive into Bend to find good beer...there's obviously lots of it there. There was nothing decent in Sunriver. My how things have changed. I spent a few days marauding around central Oregon last week. Nothing like a short road trip to beer country. I did the obligatory Bend tour...with stops at Boneyard, Good Life, Silver Moon and Worthy. I'll maybe get around to talking about those visits in a day or two. Sunriver is what's on my mind. They finally have a beer destination in the resort community. The Mountain Jug opened back in March and it's the kind of place you're apt to visit often during any stay in Sunriver. Thankfully, the Jug is not located in the carnival that is Sunriver Village. Nope. It lives in the Sunriver Business Park, which is just off South Century Drive (as you're headed toward Mt. Bachelor). Good omen. The proprietor is Mark Cornett. It's a strong beer name. As I sipped a beer and talked to him, he told me his wife, Tonya, convinced him to leave construction and open The Mountain Jug, a combination bottleshop and taproom. Most beer fans know Tonya as the brewmaster at Bend Brewing for many years before moving to 10 Barrel Brewing a short while back. Go figure. This place is quite charming. It has the look and feel of a log cabin on the inside, with several nooks where you can sip on your beer away from the flow. They have 12 rotating taps, but you won't find anything from Portland or Hood River here. They serve only central Oregon beers here. They were pouring beers from Boneyard, Good Life, Silver Moon, Worthy, Deschutes, Crux, Cascade Lakes and Three Creeks when I happened by. Nothing to hate on the list. There's more. 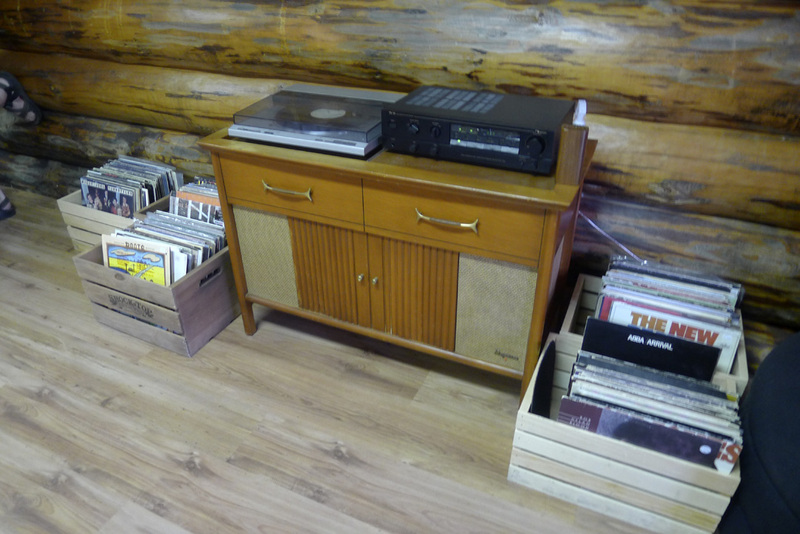 Keeping with the low key nature of the place, there's a turntable surrounded by boxes of vinyl on one wall. Mark worked his way through some classics while I was sipping on a couple of pints and yakking with some locals. His beer duties were interrupted every 20 minutes or so while he flipped the LP or picked something new. I suggested plugging in an iPod and just letting the turntable run. That drew a laugh and a smile, but I don't think it's happening. 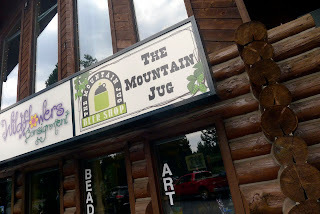 I can help thinking the Mountain Jug is a great idea. There have been so many times over the years when I've wished there was a place to go after a day of skiing, hiking or whatever. There are an almost endless list of outdoor activities to make you thirsty around Sunriver. Now there's a place where you can find great beers on tap and a nice selection of bottles. It was steady, not crowded while I was there. I can see this place being pretty jammed during peak season. I doubt Mark and Tonya will mind. For anyone wondering, yes they have no food at the Mountain Jug. Like a lot of taprooms these days, you are welcome to bring in your own food or have something delivered. 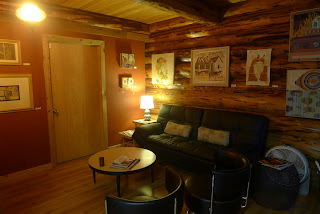 There are family-friendly tables and couches spread around to make things as comfortable as possible. The stereo is not set to play loud, so perish the thought of a rock concert atmosphere. This place marks quite a change from the status quo of Sunriver. Finding a snooty wine bar or grubby yuppie restaurant hasn't really been a problem. But the rising tide of craft beer has changed the landscape. Now there's a charming, down-to-earth beer joint in town. You gotta like its odds.